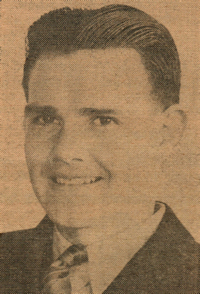 Obituary – Mickish, William Jack « Perry High School Alumni Association, Inc.
– is the son of Mr. and Mrs. Frank Mickish of near Perry. Willie was born here in 1921 and has always attended schools in Noble county. He was interested in football, wrestling and student council work in high school. He was outstanding in F. F. A. work and took part in other activities including the high school operetta and the senior play. Swimming and photography occupy his spare time. He plans to complete his education at Oklahoma A. and M. College with a course in animal husbandry. ﻿Former Perry resident Lt. Col. William J. Mickish, U.S. Air Force, Ret., 76, died Friday, Aug. 7, 1998 in San Antonio, TX. Funeral was Tuesday, Aug. 11 at Shepherd King Lutheran Church with Dr. John Braulick officiating. Burial with full military honors was in Ft. Sam Houston National cemetery. A memorial was established to benefit Shepherd King Lutheran Church. Mickish, the son of Frank and Teresa Mickish, was born at Perry on Nov. 5, 1921. He attended rural school and graduated from Perry High School. He attended Oklahoma A&M College for one year before entering the Army Air Corps on Sept. 16, 1940 at Brooks Field, TX. Mickish was accepted as an aviation cadet and received his wings on Jan. 14, 1943. His extensive military service included World War II missions over Burma, China, India and Japan in the Pacific Theater while a B-29 pilot. He was taken prisoner of war in Tashkent, Russia after landing his disabled aircraft in a field near Valadivostok. Mickish and Doris Kathleen Bart were married on March 30, 1946 after he returned from Russia. He retired from the United States Air Force March 31, 1970 at Kelly Air Force Base. He obtained a bachelor of arts degree from the University of Denver in 1949 and a master of arts degree from St. Mary’s in 1970. After retiring from the military, Mickish taught life and earth sciences, chemistry and geology at Edgewood ISD. Later he taught government at SAC. His first wife died in 1993. Mickish and Margaret Wender were married in 1994. He was a member of Shepherd King Lutheran Church and had resided in San Antonio for 37 years. In addition to his first wife, he was preceded in death by one son, his parents, two brothers and three sisters. Survivors include his wife, Margaret; two sons and one daughter-in-law, Dr. Alan B. Mickish and his wife, Paula, Ft. Worth, TX, and Donald L. Mickish, of New Hampshire; a daughter and son-in-law, Karen Zemis and her husband, Russell, San Antonio; seven grandchildren, several step-children and their families, one brother, A. J. Mickish, Edmond; three sisters, Katie Zavodny, Red Rock, Frances Hansing, Perry, and Irene Gum, Tulsa; and numerous nieces and nephews.